You think you have it rough because you spent the weekend eating tequila-soaked watermelon? That’s Juicy Juice compared to what Saturn’s moon Enceladus has been steeping itself in. Astronomers have spotted the organic molecule methanol surrounding the icy moon. Methanol, in case you forgot, is a highly toxic form of alcohol that can literally leave you blind—but after millions of years, we’d wager Enceladus’ tolerance is pretty high. Recently, a team of researchers at Cardiff University used ground-based telescopes to detect an “unexpectedly large” methanol signature in Saturn’s second outermost ring, called the E ring. The team was able to trace the molecule back to Enceladus, which happens to sit squarely inside the E ring and feed the ring material via its icy plumes. The detection suggests material from Enceladus’ plumes—which vent seawater, hydrogen, and simple organic molecules from a subterranean ocean—undergoes all sorts of chemical reactions once it’s spit out into space. “Recent discoveries that icy moons in our outer Solar System could host oceans of liquid water and ingredients for life have sparked exciting possibilities for their habitability,” Emily Drabek-Maunder of Cardiff University, who presented the findings on July 4th at the National Astronomy Meeting, said in a statement. “But in this case, our findings suggest that that methanol is being created by further chemical reactions once the plume is ejected into space, making it unlikely it is an indication for life on Enceladus.” NASA’s Cassini spacecraft has previously detected molecules like methanol in Enceladus’ icy plumes, but this marks the first time a ground-based telescope has observed the stuff. 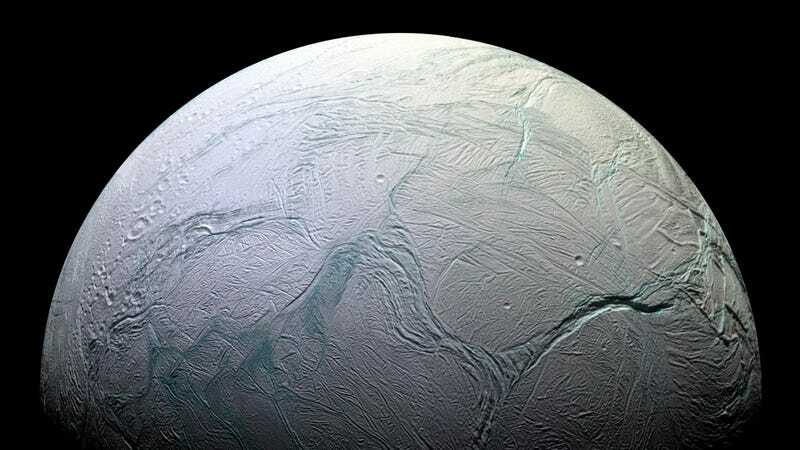 Researchers aren’t entirely certain why Enceladus is shrouded in a toxic booze haze—we explicitly told Enceladus not to chase Lime-A-Ritas with methanol, but here we are. The researchers suggest that gas from Enceladus has been caught by Saturn’s magnetic field, or dissipated from the plumes to regions much further out in the E ring. Astrobiologists will continue to hunt for clues around the possibility of the Saturnian moon supporting life. In the meantime, will somebody please call Enceladus an Uber? This is getting embarrassing. Called DART, the plan would see a refrigerator-sized spacecraft smash into a non-threatening asteroid. Aldrin tried to liven the room with a Buzz Lightyear quip, only to have Trump crash and burn on the landing pad. Can Gecko Feet Help Us Clean Up Space Junk? In light of Asteroid Day, which is today, we’d like to clarify some of the apocalyptic misinformation that’s spreading.